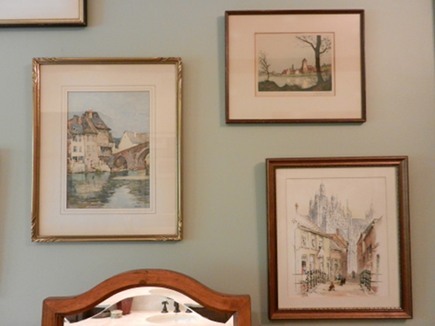 A collection of European etchings, on an bathroom picture wall, creates a relaxing atmosphere. I have this thing for vintage etchings, but not just any etching. It must have one or more of the following: a lake, stream or pond is a given. A bridge — arched stone bridges are favorites — and a structure with architectural interest. 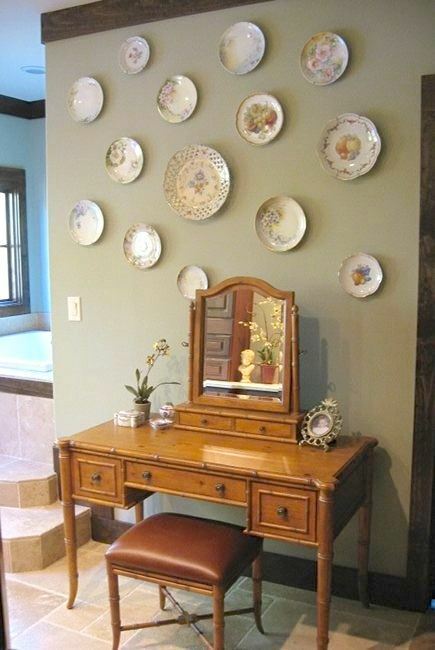 A few years ago, Jane gave a tour of our Alabama Stone Cottage which showed a vintage plate collection hanging over my vanity in the master bath [bottom]. The fruit and hand painted floral pieces were displayed in the dining room of our last house. When we moved, I wasn’t ready to permanently pack them away. And while I’ve enjoyed them for the last seven years, I was getting the itch. My passion for etchings came in handy. I had purchased several for our son who then changed his mind, so I had a head start. With modern day ventilation, I’ve never been afraid to hang artwork of any kind in a bathroom or powder room and haven’t had any problems, even in small spaces. While Jane likes to hang artwork in a formal fashion, I like the random, added on to “over the years” look. Neither are easily achieved by the eye alone, so we often use the paper pattern method in order to get it right the first time. 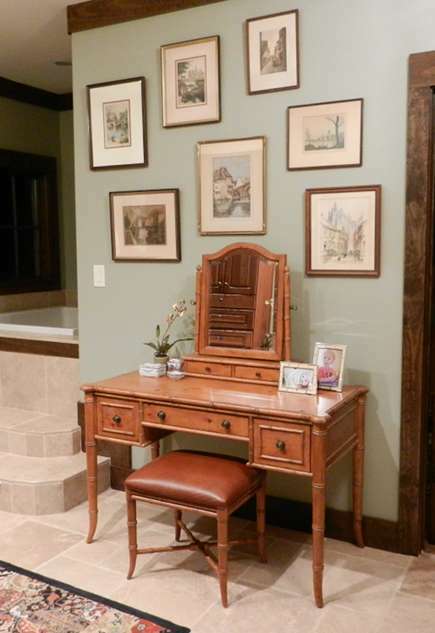 I use the vanity daily, so now I cannot imagine not having one. Photographs of my two grandchildren and my maternal grandparents’ smoking set are reminders of my family’s past, present and future. I thought I would miss the plate collection, but the vintage etchings that created my bathroom picture wlal evoke memories of Europe and I find myself daydreaming of a stroll along the water. See Informal Picture Wall for detailed paper pattern method instructions. Love your collections…they are so relaxing looking! I could be happy with either scenario.